Should You Drink Apple Cider Vinegar and Honey? Science has explained so much about our bodies and various illnesses. Yet, we continue to search for remedies that are natural. Many people have become distrustful of big pharma. They look to the past for a more homeopathic answer. Apple Cider Vinegar and honey has become one of the most popular treatments for a variety of issues. What can it do and does it work? Vinegar has been used in countless ways around the homestead for centuries. It is a traditional home remedy dating back to ancient Greece. Apple Cider Vinegar is basically fermented apple juice. Yeasts turn the sugars in the juice into alcohol. Then, bacteria turns the alcohol into acetic acid. This action creates a strong, quirky tasting product! Does anyone really like the taste? Perhaps so, but having a good flavor is not the major appeal of this apple cider vinegar. Vinegar is a staple in most kitchens. It is used in salad dressings, baking and other cooking activities. But it’s not just a food product. Historical records note the use of vinegar for wound care. Vinegar is known to have antioxidants called polyphenols that curb cell damage. So, just how much of this wonder drug do you need to consume? Whoa…just a minute. Let’s meet the other player in this game. Honey. Honey is a wonderful substance made by honey bees. Bees gather plant nectar from blooming flowers. 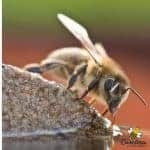 Through a process of reducing water content and enzyme action – bees make honey. Honey is a perfect food for our honey bees to store for Winter use. Honey is antibacterial and will keep indefinitely if protected from moisture. It provides a rich energy source for our bees during the times of year when no flowers may be in bloom. 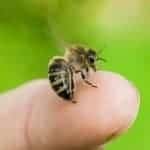 And yes, we humans enjoying eating honey too! 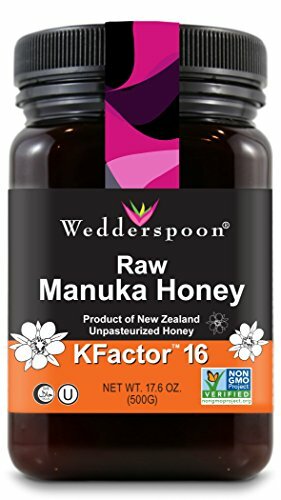 What Kind of Honey is Best to Use? When you are pairing apple cider vinegar and honey for homeopathic purposes choose pure raw honey. Can’t you grab a jar of honey at the local market? No, not usually. Many varieties of commercial honey have been micro-filtered and/or pasteurized. This process destroys many of the beneficial enzymes in honey. Try to find a local beekeeper for your honey purchases. Small scale beekeepers do their extracting and bottling by hand. They will often have the best honey products. Be sure to choose pure raw honey. Is Apple Cider Vinegar and Honey Good for You? It is very difficult to find any medical reports to confirm the benefits of consuming Apple Cider Vinegar and Honey. However, untold millions of people believe that it helps them to feel better. Whether taken as a general tonic or used for a specific purpose, these folks make it a part of their daily ritual. One word of caution: Apple Cider Vinegar and Honey are highly acidic. It can damage your teeth, cause an upset stomach and hurt your throat if you drink too much of it. Moderation is the key. What is Vinegar and Honey Good For? Apple Cider Vinegar and Honey is most likely not the super cure that we wish it was. However, you will find remarkable claims out there. Consumers claim it lowers cholesterol, soothes indigestion, and promotes heart health. Some sources credit Apple Cider Vinegar and Honey tonics for weight loss. What Type of Vinegar Should You Use? 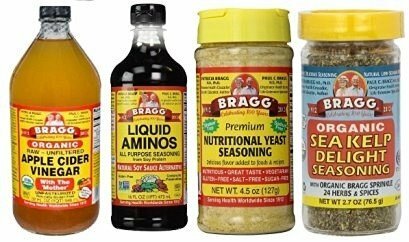 By far the most popular type of Apple Cider Vinegar in use is – Braggs Apple Cider Vinegar (with the Mother). It is organic, raw, unfiltered, naturally gluten free and Certified Non-GMO. When I am consuming anything raw I am especially concerned with the source. This company has a good track record of producing a good product. Does this stuff really work? Who knows. But, lack of reputable research studies has not discouraged the millions of people who believe it makes their lives better. As with any substance, always consult your doctor before taking. This is doubly true for children. *This article is for information it is not for medical advice. One of the most common methods of consumption is a general tonic taken daily. It is believed to boost immune system health, remove toxins from the body and promote good digestion. 1 or 2 Tablespoons of Braggs ACV and 1 or 2 Tablespoons of Honey is mixed with an 12-16 oz of water. Is Apple Cider Vinegar and Honey Good for Arthritis? Arthritis sufferers have used vinegar poultices for aching joints for a long time. Consuming ACV and Honey may also be of benefit. By helping balance the body’s ph level, acid buildup in the joints is reduced. Also, crystals forming in the joints may be broken down and flushed from the system. Make a cup of Peppermint tea, stir in 1 Tablespoon of ACV, 1 teaspoon of honey and 1 teaspoon of Cinnamon. You can take this recipe 2-3 times daily as tolerated. Few things are worse than not being able to go to sleep. Lack of a good nights sleep can make the next day miserable. When this continues long term, it can negatively affect your general health. Again, some folks rely on ACV and honey to promote sleep. The idea is that honey causes a rise in insulin which releases serotonin. The body converts serotonin into melatonin which regulates sleep. Vinegar breaks down fatty acids and releases tryptophan. This is used by the body to make serotonin. And, melatonin is the end result. Will Apple Cider Vinegar and Honey Help You? There is no way to know that answer to this question without giving it a try. No scientific studies can prove it’s effectiveness. But, thousands of people consume this combination every day. Perhaps in time, we will learn even more about how and why apple cider vinegar and honey seem to make the lives of many so much better.